Remember this picture that I blogged a few days ago?..well, miniufo at SS501UFO.blogspot.com has done a terrific translation of the article in the magazine !! Me so happy and really appreciate all her work....a BIG Thanks 4U !! How many are there that deeply fell in love with the white horse rider, "national sunbae" Yoon JiHoo in "Boys over Flowers", and how many obsessed to the Korea group SS501's leader Kim Hyun Joong on stage.... idol's existent, originally is for admiration and indulgence. But Kim Hyun Joong said: "Don't fantasized me, I am just a legend." 29 August 2009, ZhaoYang Stadium, on SS501 Beijing Fan Meeting's stage, when he used the perfectly normal expression and blurted this popular China internet classic quote, causing the entire audience shrieks in high decibel and burst into laugters. Alien mentality erupted again? At that moment, most people think like this. But is it really true? This 24 years old Korean Idol Kim Hyun Joong, when comparing to the other idols in his country, what are the unique character that caused him became a "legend"? The birth of legend: Which star are you from? All the while, Korea idols are like a doll that do not consume human food, being beautifully packaged, placed in the window display for people to admire. But Kim Hyun Joong are definitely not like this. Year 2005, debut when he was 19 years old, he was like a wild horse that ran around unrestrained. Having the "Country No 1 bravery, World No 1 abnormal"'s fearless spirit, he created a brand new style in Korea idols. In the variety show which recorded the members daily life "Thank you for waking me up", no matter what means the host and member tried, Kim Hyun Joong was forever the last to wake up. When being asked his opinion, he would complained: (After watching the broadcast, then realized) I don't have a lot of air time, when I opened my eyes, the show ends." And in one of the episodes in "Thank you for raising me up" variety show, he was just like a full of freedom gourmet cook, while cooking he started to rant: (Holding a mineral water) "This is not normal water, it is water melted from south pole's ice cap. An acquaintance of mine, he brought this back for me when he went there for research." (Again, holding a carrot) "This is also not a normal carrot, it is very precious, it will only grow 1cm each year. Please look at this, it looked like an chicken egg, but it is actually an eagle egg, and it is not a normal eagle egg, it is the endangered species of eagle - Bald head eagle's egg." When the host point at the cucumber and ask discretely: "What about this cucumber?" He answered naturally: "It is a normal cucumber, at least I must prepare one normal item right?" At that moment, how many audiences was like the host, knelled down defeated in front of the television. From then on, everytime when Kim Hyun Joong has any additional amazing quotations or frequently performing his 4 dimensional acts, everybody will quietly cry in their heart thinking: "Kim Hyun Joong, which star are you from?" 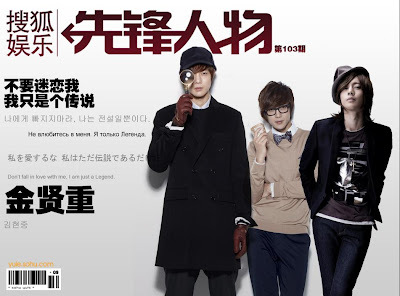 Now when mentioning about Kim Hyun Joong, it can't be not associated with "Boys over Flowers". All you can say is life encounter is always so marvelous. Some seek high and low yet not unable to find the entrance, but some, unintentionally become successful. In the Korea entertainment circle, when a singer go into acting, most of the time he would not be well recognized. Especially idols, they just need to have a beautiful face, dancing in the stage, and 'catching' the hearts of young girls. In short, there's no need of connotation, and also technical substances. Withstanding such pressures, he began his 1st official drama, which was filming of the highly anticipated "Boys over Flowers", the level of pressure was imaginable. Although acting in the popular variety show "We Got Married" had gained him lots of popularity and after "Boys over Flowers" was broadcast, his popularity increase speedily. Although "National Sunbea" Yoon JiHoo overnight he become the perfect vision in most girls' heart. Although receiving such crazy infatuation and gaining both fame and fortunes, he could not run away from accusations like "acting skill to green", "unworthy of the role", etc. Facing all the critiques, it is not easy to keep his cool even how magnanimous the person is. But Kim Hyun Joong, after reading postings on internet like "Kim Hyun Joong's mind is problemation", he could actually replied "Agreed". To him, the most unacceptable thing is actually praising blindly. "Personality charm" these 2 words, seems to feel too heavy weighted when used on a 20 over years old young man. If the Yoon JiHoo in drama was too perfect to exist, then the Kim Hyun Joong that gave such honest statement: "In the beginning, I dislike SS501", definitely feels more real. Reporter: Have you worked in many jobs? Hyun Joong: Deliver Pizza, deliver fried chicken, and also deliver newspaper, I have also did daily-paid part time work before. My life is far more rough and rotten that what you had seen. (Smile) Until now I had never asked for pocket money from my parents. Reporter: When everybody commented about your acting skill, what is your reactions? Hyun Joong: I will accept the comments. Even my fans, I also don't agreed with them for blindly complimenting me. If you truthfully treasure a person, you should not hesistate to even speak nasty word to the person, so that he will grow. Reporter: In Korea, it is very hard to be an idol star? Hyun Joong: It depends on the person. I have full freedom and live without caring about the fans view. Although there are some fans who would wait at the hostel, sometimes I would scold them and chase them back home. They might regretted that they like me in future when they grow up, therefore, I had been treated them coldly. Reporter: Have you regretting dropping out from school? Hyun Joong: With a secondary school qualification you can't do anything. No matter where you go, you were labelled with a drop out student sticker until 17 years old. Korea is still a country that emphasize on ability, comparing to some develop country it is still far off. Reporter: What kind of son are you when at home? Hyun Joong: A son who is cold in speech. "Thank you", "Love you" kind of speech will never be spoken. When young, I was caught because of group fighting, my parents was summoned to the police station a few times, my mother who was faultless became a sinner become of me, I will treat her well in future. That is something that I felt regretted and guilty about, I have been wanting to repay/compensate her back. Reporter: Wherever you go, you are in the limelight, how is the satisfaction? Hyun Joong: Popularity? It is useless. Looks good looks charming, looks like being supported, but one of these day, all these would be gone. I am nothing, just being illuminated by lights now. 31 March 2009, Kim Hyun Joong together with 5000 Asean fans and SS501 members, enjoy his life 1st drama "Boys over Flowers" final episode. This special and meaningful fan meeting event was name: "Goodbye, Yoon JiHoo; Thank you, Kim HyunJoong". Sending off the glittering lime light from the "National Sunbea" Yoon JiHoo, he is still that 'out of the line' leader in Korea group SS501. 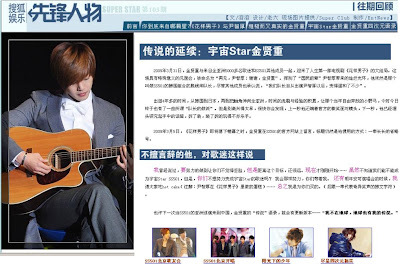 Although some members mentioned that: "Since our leader acted as Yoon JiHoo, he became more gentle." Debut for more than 4 years, from Korea to Japan, and expanding it lead to world Asia, being scrubbed by time and accumulation of experience, the once free and unrestrained little wild horse, has shown more of the "leadership" character. But don't get happy so fast, you will realise very quickly, at one moment he was showing his official smile to the camera, the next second, he had already started examining his mic, dismantling it, and after that seems to enjoy it very much. 3 March 2009, before "Boys over Flower" going to end, Kim Hyun Joong left a note in SS501 official website, using his usual title of a long string of dots. "Even I am not on earth, earth will have my legend"
2. When ask if being scouted by other management company, Kim Hyun Joong: "Even giving me 100 billion I also refuse. Refuse without any reason. It is fate that brought 5 of us together, this fate is more valuable than 100 billions!" 3. When ask the about the close friendship among members, Kim Hyun Joong: "As times goes, people started to know us, they will observe all our move, so we seldom go out to play, since 5 of us will always play together in the room, over the time, we become closer." 4. In fan meeting, Park Jung Min: "How many fans come today?" Kim Hyun Joong: "Very difficult to say, signing pen or light stick level?" (Note: In Korean "Pen" & "Fan" has the same pronunciation"
5. During the 1st day of debut, in the high rise building stage, Hoe Young Saeng go across the barrier and looked down, Kim Hyun Joong: "Ah, you would fall down. What would happen if you are dead before the debut?" 6. When ask why they do not hold their activity in USA but Japan, Kim Hyun Joong: "Although we also want to have our events in USA, but we scared we will be shot there." 7. Year 2007, when just starting their promotion events in Japan for not long, reporter ask: "How's the Japanese level of Park Jung Min?" Kim Hyun Joong: "About Kindergarten level"
Kim Kyu Jong: "Not long ago he participated in a talk show." Kim Hyun Joong: "So it means not long ago Jung Min already attended kindergarten school." 8. Reporter: "To you, what is the meaning of "4 Chance"? ("4 Chance" is a song in their album)"
9. On the way to one of the events, Park Jung Min: "Why are you here?" Kim Hyun Joong: "I sleepwalk from home to here." 10. Before "Melon" concert, when ask what is his worries, Kim Hyun Joong: "Mid Autumn Festival is approaching, seems like there are a lot to prepare, Kim Kyu Jong, have you prepare anything?" 11. When seen a woman picking pearl in the sea, Kim Hyun Joong: "What do you do if there's a shark?" 12. Park Jung Min: "He is very abnormal." Kim Hyun Joong: "What? A patient? Fish will also fall sick. If you go down to around 1000m under sea level, you would be able to see sick fishes." 13. "M! Pick" host ask Kim Hyun Joong why he was fondling Park Jung Min's stomach. Kim Hyun Joong: "I always fondle Park Jung Min stomach, because this stomach is going to give birth to a baby in future"
14. In year 2008 interview, the host ask about each member's role in SS501 new song "Song calling for you" MV. When introducing to Park Jung Min scene in a white room, acting as an angel, Kim Hyun Joong: "That don't look like heaven, it is like a Mental Hospital."